Alkenes are a homologous series of hydrocarbons which contain a carbon-carbon double bond. This double bond is shown in formulae as a double line. 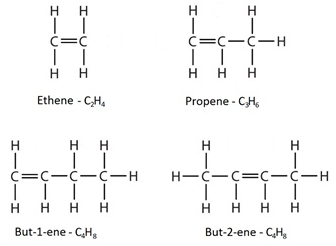 The names of alkenes end with “ene”. For a molecule with more than two carbon atoms, the position of the double bond within the molecule can vary as indicated by the name and the structural formula. Saturated: A molecule containing only single bonds between carbon atoms. For example, alkanes as described as saturated molecules. Unsaturated: A molecule containing a carbon-carbon double bond. For example, alkenes as described as unsaturated molecules. The displayed formulae show all the atoms and bonds drawn out. The molecular formulae just show the number of each type of atom in the molecule. Alkenes react with bromine water. UV light is not required for this reaction. The double bond is broken and the bromine atoms are added. This is an addition reaction. During this reaction there is a colour change from orange to colourless. This is how we can test for the presence of an alkene or another type of unsaturated molecule.